The NZ International Film Fest is a couple of weeks away. I've already started my post-it note system. I've managed to schedule around 20 films... wish I could actually see them all. Season 2 of True Blood has, so far, has had some awesome moments. I'm loving seeing more of Eric, including his gory scene complete with his hair in foils. 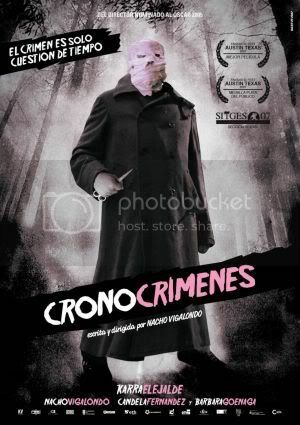 Timecrimes, 2007 Spanish film, = brilliant. Just watched it and loved it. I wanted to see it at the last film fest - only took a year to finally track down a copy. Trip to Whangarei for work went "ok". Spent more time in the car than in the office (and while in the office there was problems with their network, which didn't help me). Off to Dunedin on Tuesday. Not looking forward to it. Again, will end up spending more time in a plane travelling than in the office training. Plus, will be freezing. *sigh*. Been visiting Evette in hospital. She's doing ok; baby hasn't come yet thankfully. Hopefully he'll stay put for another 4 weeks, then they'll give her a c-section. He'll still be prem, but better off than if he'd come last Thursday! Spending $9 million on referendum for our 'anti-smacking' bill makes me mad. That money could be spent in sooo many better ways.